I can’t believe summer is almost over, but bbq season runs year round in my household. I asked my kids the other night what they wanted me to make on the grill. The response was an enthusiastic “RIBS!” One of the things I tell people when making ribs is go low and slow. It’s not a complicated thing. It just takes patience. I didn’t want to make a traditional bbq sauce. I wanted a sweet, smoky, spicy flavor. And what better combo than chipotle and cherries? It turned out with the perfect balance of sweet to spice so that anyone can enjoy. It was a match made in heaven. In a medium sauce pan on medium heat add all of the above ingredients. Whisking occasionally. Bring to a simmer and lower heat for about 15 to 20 minutes. Until thick. Heat a charcoal grill to medium heat. Add coals to just one side of the grill and light. Wait about 10 minutes. Next brush on olive oil and season with salt & pepper. Place on the side of the grill where there is no charcoal. Place the lid on top. 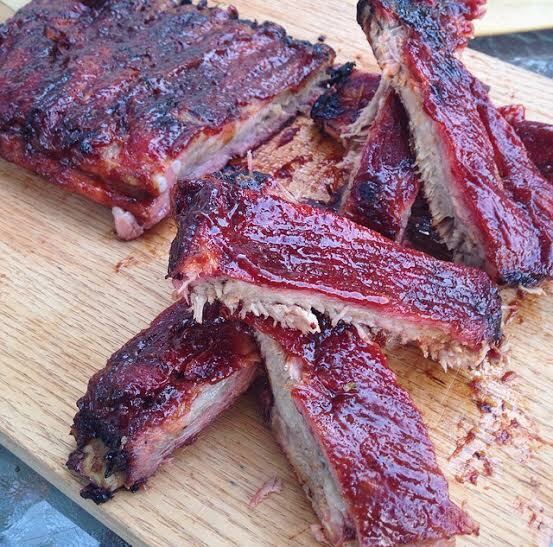 After 1 hour begin to brush on the bbq sauce every 25 minutes until you have cooked the ribs for 2 hours. In the last 25 minutes flip the ribs once. Remove and place them in foil and let rest for 5 minutes. Final step… enjoy with a nice cold beverage.